I can remember watching MasterChef and someone commenting that everyone should have a basic pastry recipe in their head. Well, I have a cake recipe in my head which is a good thing to have. It means I can bake something no matter where I am. However, I didn’t have a pastry recipe and all I could remember from this program was 3:2:1. I could not remember what the 3:2:1 stood for but I decided it had to be flour:butter:sugar from looking at my other pastry recipes. The one thing I love about making pastry is you can always make more than you need and then freeze it until you need some more. I always use my ceramic baking beads to blind bake my pastry, but you can use rice or beans instead. This sweet short crust pastry is perfect for any tart base so have fun experimenting. Do you have a recipe memorized? The pastry looks delectable Tandy. And I don’t think I do have a recipe firmly in my head, I always end up checking if I’m making things like pastry, maybe I should trust my insticts more ! 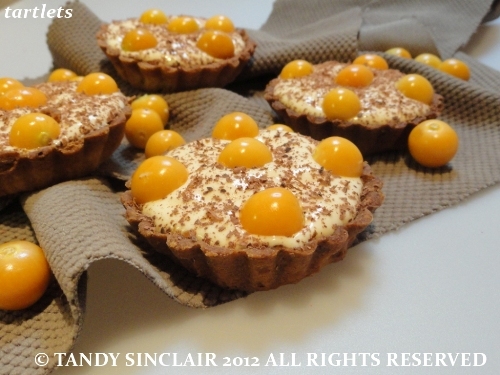 What lovely tarts! And you’re right, it’s so important to have the standbys memorized! Such pretty tarts!! Does the fructose help with the cohesiveness of the dough? Or add a nice flavor? That IS easy to commit to memory, thanks Tandy! I use 175gms flour, 75 butter, 50 sugar and 1 egg yolk. It’s a really short and sweet pastry. I shall give it a try!